So there is this new system out called Cash Formula that you can supposedly make $5000 a day with… But of course that sounds a little bit too good to be true, does it not? This then probably leads you to wonder whether or not this is just another crappy scam that is going to be a waste of your time. Is it a scam? Does it actually work? How does it work and why is this guy deciding to let people in on it? Lots of questions that need answers… and you are in the right place. In this quick review I’m going to be giving my honest opinion of it, which is not too good as you will see and as you are probably expecting. So my first impression after landing on the sales page is that it seems pretty darn scammy. False scarcity – You are told “only 7 new spots available” and also that the video could get taken down at any moment because the gurus are out to stop this guy. Seemingly fake testimonials – The video testimonials of the people who have supposedly been using the system and making all kinds of money just don’t seem genuine…. it seems like the people are reading off scripts half the time. 100% done for you – Of course…. and so is just about every online scam ever. Up to $5k in 24 hours and every day after that – Okay… insane earnings… another common characteristic of a scam. Tells you that what he is going to show you is “100% certified and true” due to the federal guidelines he has to follow – Completely untrue. If it were true then there wouldn’t be any scams. 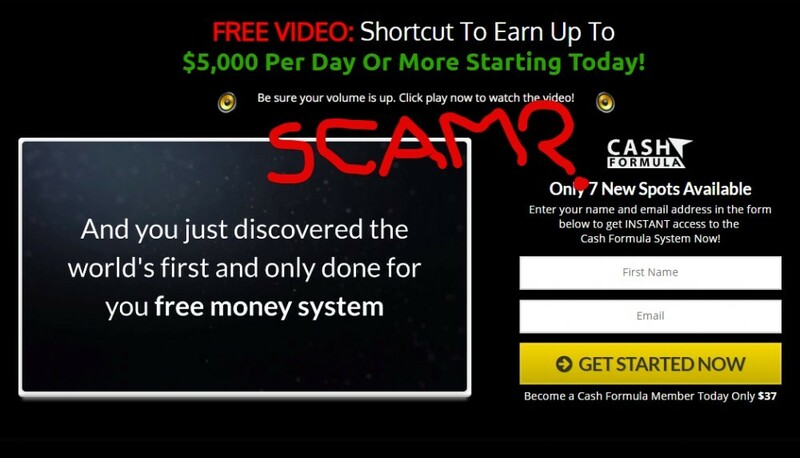 I’ve reviewed hundreds of different scams on my site here, most recently Easy Cash Club, and this is looking typical, especially when it comes to “make money online” Clickbank scams, which are becoming so popular it’s ridiculous. It definitely seems like a scam right off the bat. And to make matters worse, the guy leads you to believe that it is going to be a short video presentation of only 2 and a half minutes but really it drags on for over 20 minutes… which something else that is typical of a scam… a lie or misleading info at the least. But anyways… the creator of the system is Michael Green, who claims to go by the name “Green Machine” because of all the money he makes. He claims to be a guy that makes up to $10,000 a day… just by clicking a few buttons. He then goes on to say that he makes more in a minute than most people in an entire year, which makes no sense because if he is making $10k a day that would mean he is making around $6.95 a minute… and I don’t know about you but most people I know make over $6.95 a year. He claims that he stumbled upon this system after losing his job and bumping into an old friend that has some company that “controls millions of web visitors each month” that discovered some “loophole”. The story goes that his company bought this secret loophole formula from a group of Ukranian coders and blah blah blah. The reason I say “blah” is because what this guy tells you doesn’t really make any sense… and it isn’t supposed to. It’s supposed to sound confusing so that it seems really complex and amazing, but really it’s just a bunch of vague info that is vague on purpose. Anyhow… lets get to the point here: The story behind Michael Green’s discovery is a bunch of BS and so is the guy himself. As you can see below, the image they show you of Michael is really a free picture that anyone can use online and it is available on the freepik website. I found this out by doing a quick reverse Google image search of the picture they showed us in the video presentation. Why Is He Selling This System for Only $37? So he basically claims that he is now allowing others to use his system because he is just that nice of a guy. He talks about how he is sick and tired of all the fake gurus out there scamming people and he just wants to help out. This already sounds like something I’ve heard from just about every scam I’ve ever reviewed and to make matters worse, I already showed you that this guy isn’t who he claims to be. So how can you trust any of this? There is so much that this Michael guy tells us that just doesn’t add up. For example… he tells us that he is only letting 7 new people in today because he doesn’t want this to become too popular. He wants it to fly under the radar, so to speak, so that the gurus don’t find out. But then why the heck does it say there are 7 new spots available everytime I go to this website? You can check it out for yourself if you don’t believe me… just go back to the video in a day or 2 and it will be telling you the same darn thing. Just as expected, the guy tells you just about nothing on what you are actually buying into here. The information given is incredibly vague and this is pretty typical when it comes to online scams. They like to provide you with vague info on purpose so that you have to buy into it in order to find out more… and probably because if they did provide too much information you would easily be able to either tell that it is a scam or they would get into too much legal trouble because they would likely have to lie a bunch more than they already do. But anyways… so what the heck do you get if you buy into this? Well… honestly… I don’t know the answer because I have not bought into it nor do I intend to. HOWEVER, I can tell you that what you will be getting will be nowhere near what you are expecting to get if you buy in thinking that this guy is telling you the truth about the system. Based on what I see here and other scams I’ve reviewed in the past that were very similar, which there are plenty of, I’m guessing that you will probably be given some pretty crappy training for some method of making money online that is just going to lead you down the wrong path and waste a bunch of your time for nothing. So obviously I’m not going to be recommending that any of my readers buy into this crap…. unless you are looking to get scammed of course, which I’m guessing you aren’t. I probably just confirmed your suspicions with this review anyhow though. After all, since you came across my review then you were looking for additional information online about this system and the reason for that is probably because it sounded a little too good to be true. Lots of lies, misleading information, lack of information and so on… Although I didn’t buy into this to find out for myself, I can pretty confidently call it a scam. If you are looking for a legitimate way to make money online (that is beginner friendly) then I would highly suggest taking a look at this guide I put together that will show you how I do so.